This book has a much wider focus than traditional books written about drug and alcohol addictions. This unique book is written by medical specialists who diagnose, treat and research addictive disorders in their specialities. Thus, it meets the needs of the typical medical practitioner who wants to learn about and treat patients with addictive disorders in their practices. Because alcohol and drug problems are so prevalent and affect medical conditions profoundly, the medical specialist will improve their knowledge and skill to diagnose and treat addictive disorders in their specialties. Drug and alcohol addictions occur commonly in medical populations; 25–50% of patients seen by primary care physicians have alcohol and drug disorders, with even higher prevalence in certain medical specialty populations. Drug use (including illicit drug use and actual or perceived misuse of prescribed medications), alcohol use, and what has been called unhealthy drinking are even more common in trauma centers and our society. 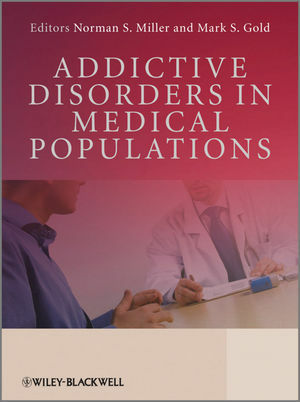 Currently, there are no authoritative addiction texts that focus on the identification, intervention and management of either “addictive disorders in medical populations” or “medical complications in addiction populations”. Neurobiological progress in the field of addiction has been amazing and evidence-based treatments have developed at a phenomenal pace, with bench to office applications for tobacco, alcohol and drugs. Pharmacological and psychosocial treatments are described here in detail and in practical terms. The medical and mental complications of addiction are explained comprehensively throughout the text. Clinical considerations are the predominant theme, with the standards of clinical practice grounded in the most current research. The chapters include practical presentations of both clinical and research materials, with instruments for screening and assessment and treatment. It will be useful for all those seeking information to help a patient or family with a tobacco, alcohol or drug problem. We hope this book can give answers and direction to the identification and management of addictions and their medical complications in patient populations. Dr. Miller has spent 25 years in clinical practice and teaching and research at Cornell University Medical College, the University of Illinois at Chicago; he currently serves as a Clinical Professor at the College of Human Medicine at Michigan State University and works as a psychiatrist at Pine Rest Christian Mental Health Services in Grand Rapids. He has published 250 medical/scientific articles, book chapters, and reviews, and 12 books on addiction medicine. He is a fellow in the American Psychopathological Association, and a member of the American Psychiatric Association, the American Society for Addiction Medicine, and the American National Professional Committees. He is a member of the Task Force on Treatment for the Office of National Drug Control Policy, Office of the President of the United States; a member of the Center for Substance Abuse Treatment on Screening, Assessment, and Treatment Planning for patients with Coexisting Mental Illness and Alcohol and Other Drug Abuse; and co-chair of the Task Force for Undergraduate Medical Education, Association for Medical Education and Research ing Substance Abuse. For the American Society for Addiction Medicine, he is Regional Director of the Midwest Region and Editor of Principles of Addiction Medicine (First Edition), Program and Publication Committees. He has coordinated symposia, courses and workshops for the ASAM annual meeting. Mark S. Gold, M.D. is an editor, author, teacher, pioneer, researcher and inventor, who has worked for nearly 40 years to create models for understanding the effects of tobacco, opiates and other drugs on the brain and behavior. He has developed models that have led to the discovery of new addiction treatments and has conceptualized novel hypotheses which yielded new approaches to the definition and treatment of addictions. Dr. Gold's pioneering work on the brain systems underlying the effects of opiate drugs led to a dramatic change in the way opiate action was understood and his seminal work on cocaine is considered classic translational science. Over the past decade, he has defined hedonic overeating as an addiction and developed animal and imaging models to develop new treatments for overeating and obesity. Most recently, he and his colleagues demonstrated that intravenously administered anesthetics and analgesics are exhaled in the air of operating rooms, present on surfaces, and available for second hand exposure. Dr. Gold and colleagues have explained the role of the workplace environment in physician drug abuse, addictions and relapse after successful treatment. Under his leadership, the Department of Psychiatry at the University of Florida has grown to 60 full-time clinical physicians and researchers with new projects and research groups in secondhand exposure models, functional brain imaging, self-administration, public health, impaired professionals, genomics, proteomics and nanotechnology. Dr. Gold has been awarded numerous national prizes and recognition for his work, leadership, and mentoring. Since beginning his career in research at the University of Florida in 1970, he has been the author of over 900 medical articles, chapters, and abstracts in journals for health professionals on a wide variety of psychiatric research subjects and has authored 12 professional books including practice guidelines, ASAM core competencies, and medical text books for primary care professionals. He is the author of 15 general audience books. According to a review in the Journal of the American Medical Association (JAMA 272:18, 1996), "Mark S. Gold, M.D. the most prolific and brilliant of the addiction experts writing today... Dr. Gold has spent his career trying to bridge the gap in medical education and practice with the belief that addictions are diseases and that all physicians have a critical role in prevention and, if that fails, in early identification and prompt treatment."